For the third year in a row, I hosted a wine tasting for a neighborhood garden club at Chain Bridge Forest in Arlington, Virginia. Some 12 participants – all with casual to keen (but non professional) interest in wine – tasted in the following order. Although they knew which wines were to be served, each wine – when it was served – was brought in a brown paper bag so that that wine was not known initially. Before each wine’s identity was revealed, we discussed its merits (or demerits). By the time we ended the tasting, I asked participants to vote on each wine: (1) was that your “number one”? ; (2) was it your second favorite and (3) was it your third? An indication of popularity was the wine that obtained the most votes (whether 1st or 2nd or 3rd place). Please keep in mind that one of the most important criteria for this group (and, let’s face it, for most of us) was price! Stay tuned for some surprises. Below the wines – served in the following order – and votes they each received with tasting notes. For different reasons, these two proved among the most disappointing of the tasting. Domaine Carneros by Taittinger Brut California USA 2009 ($24). This was clearly better. More energy. Smooth. Lacked character for me, but then again, I have been drinking some superb Champagnes recently :-). Still, overall, it was a winner. And for the price, hard to beat. SEVEN VOTES (5 for first place, two for second and two for third). Segura Viudas Brut Heredad Reserva NV Alt Penedès SPAIN ($20). Most participants preferred the smooth nature of the preceding wine, but many liked this one more for having “quite a bit of character.” It conveyed more concentrated flavor on the mid palate – the most so far – but it was not quite as smooth as the previous wine. FOUR VOTES (zero for first place but two each for second and third). A pair of fine and dare I say slightly misunderstood Italians? Domaine de Montbourgeau Crémant de Jura FRANCE $25). Flawed bottle. Light cork aspect. 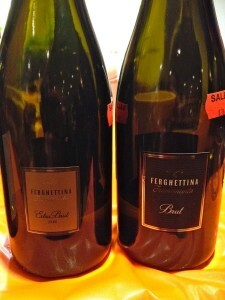 Ferghettina Franiacorta Brut NV ITALY ($33). This for me represented a noticeable step up, but it was quite pronounced in flavor. 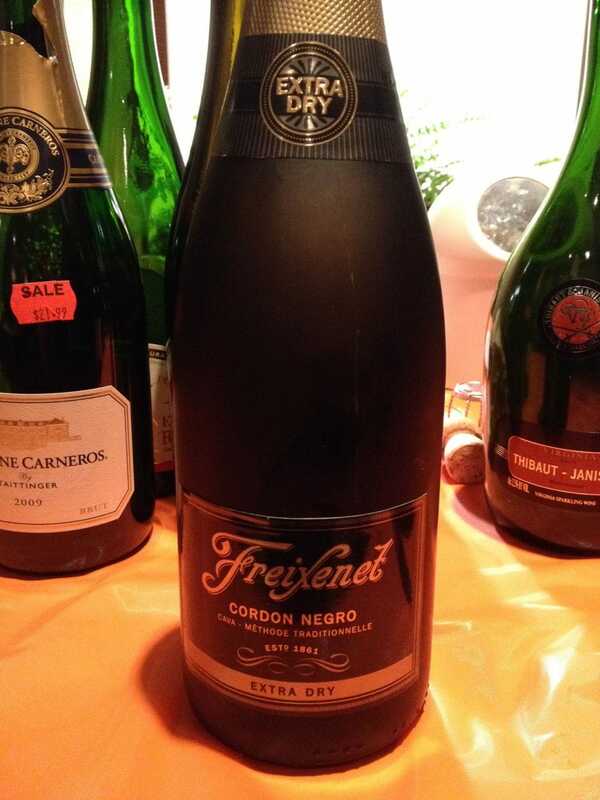 Not as smooth as the Carnernos – or typically “Champagne like” and perhaps for that reason did it only obtain one vote albeit for second place. As we shall see for its vintage sibling later in the tasting, both of the Ferghettina’s have lots of character on the palate – and I liked them probably more than the group did. ONE VOTE. Holy Moly! Virginia wins with the most votes. 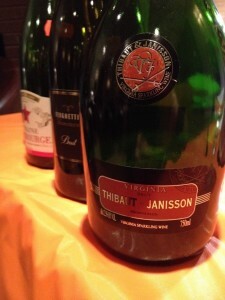 Thibaut & Janisson Virginia Brut USA ($28). Surprise, surprise. This wine obtained a whopping 12 votes – 3 for first place, 6 for second, and 3 for third – because it was so smooth and soft and lively too. I went back to this and just loved it. The initial nose, when first tasted, made me think “this is Blanc de Blancs Champagne” because it was so clean and smooth and appealing like a Blanc de Blancs can be. As NY Times wine writer Eric Asimov recently wrote, they tend to be the lightest and the driest and this one seemed that way, too – although I would say that it was just a touch on the sweeter side of Brut! But it is made from vines grown in Virginia, and the price is hard to beat. TWELVE VOTES! Wine of the tasting. The top three of the tasting. 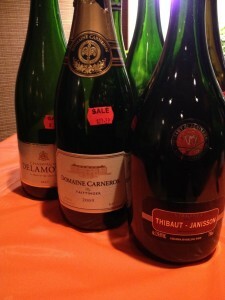 Domaine Carneros obtained the most first place votes. I really liked the clean crisp aspect from the Delamotte. 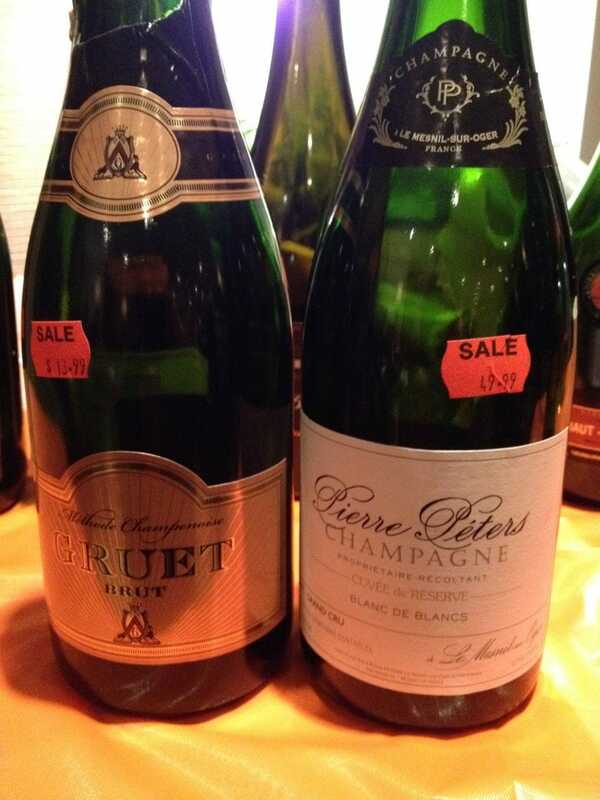 Pierre Peters Blanc de Blancs Grand Cru NV FRANCE ($55). Now I have had wines from this producer before, notably vintages, that were very good indeed. Hence a negative note for this NV wine. Costing about $55 tax included, this is too high a price for the rather ho-hum delivery. It was technically fine, with decent bubbles and amiable flavor with a smooth delivery. But I was expecting more from grand cru blanc de blancs as it lacked energy and any kind of “wow” factor – which was expected when compared with far less expensive alternatives in the tasting. NO VOTES! Good for mimosas and more. Brut Zero is the driest. Not very common, but can be found among growers’ Champagnes and some famous name brands. It is a growing trend as consumers seek bone dry Champagne.